think strategically about how to build your practice effectively and efficiently? know how your work impacts your clients’ business goals and practices? network to make your goals a reality? 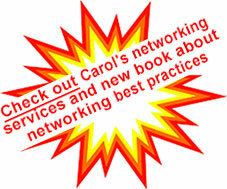 Networking stories, tips and worksheets for creating your own networking success. To try a sample chapter from the book, click here. The result: new business around issues you want to work on, with the kind of clients you like to work with. Coaching/training should reflect real life. Carol’s coaching and training programs teach lawyers how to set client expectations by turning the features of their firm and practice experience into the relevant benefits and value-adds that clients want. With her book as a guide, lawyers learn to network successfully online and in-person.